On Wednesday, Tampa Bay Lightning Vice President and General Manager Steve Yzerman announced that Cory Conacher signed a one-year, one-way contract with the team worth $575,000. Welcome back, @conhockey19! We’ve signed Cory Conacher to a one-year, one-way contract. 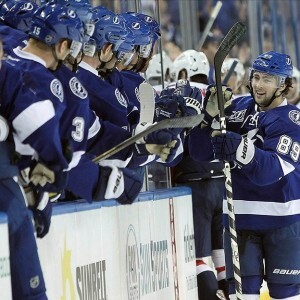 Conacher, 26, previously played 35 games for the Lightning during the 2012-13 season, scoring 9 goals and 24 points, after being signed as an undrafted free agent on March 3, 2012. On April 3, 2013, the Lightning traded Conacher, along with a 2013 fourth-round draft pick, to the Ottawa Senators in exchange for goaltender Ben Bishop. In his NHL career, Conacher has appeared in 141 games, compiling 19 goals and 58 points. In 166 American Hockey League games, Conacher has scored 67 goals and 153 points, and during the 2011-12 regular season, had career highs in goals (39) and points (80) with the Norfolk Admirals. In the playoffs that year, Conacher would lead the Admirals to the Calder Cup Championship and was later named the AHL’s regular-season MVP. Conacher, a 5’8″, 180-pound center, played for Bern SC of the Swiss-A league during the 2015-16 season, tallying 22 goals and 52 points in 48 games. During Bern SC’s run to the National League A title, Conacher scored 9 points in 14 games and was named to the tournament’s all-star team. During the 2015 Spengler Cup Tournament held this past December in Davos, Switzerland, Conacher helped Team Canada to a first place finish and was named to the tournament’s all-star team.